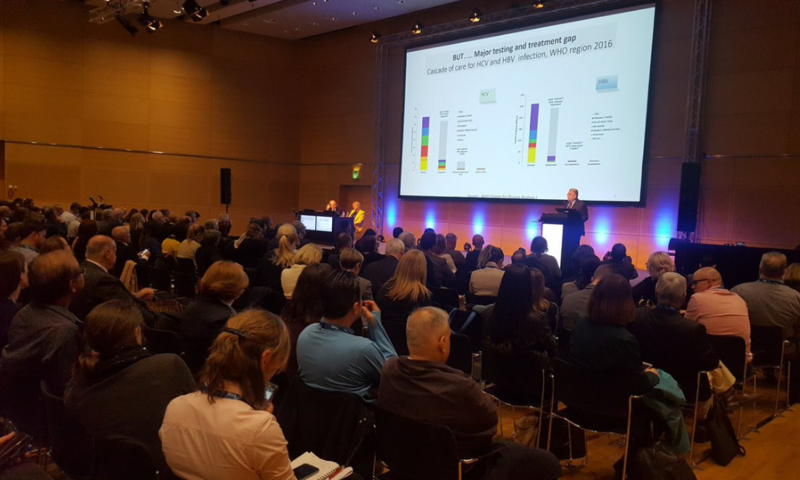 Screening for hepatitis C, confirmation of chronic infection by point-of-care viral load testing and treatment initiation can all be achieved on the same day in a community setting, Egyptian researchers reported at The International Liver Congress in Vienna on Thursday. Egypt has the highest prevalence of hepatitis C in the world and the Egyptian government is committed to a massive elimination programme that aims to screen 61 million adults and 15 million adolescents by 2020. For any country, the number of steps that a person must go through to be diagnosed and treated for hepatitis C pose one of the biggest challenges to achieving elimination. People who test antibody positive on a screening test must be tested again for chronic infection using a test that can detect the hepatitis C virus – an RNA test, requiring a laboratory test capable of amplifying viral material. Then, people diagnosed with chronic infection must be referred to a clinic where they can start treatment. At each of these stages there is a risk that people will be lost to follow-up, because they do not receive test results or cannot attend a clinic. Reducing the risk of loss to follow-up by trying to deliver as many interventions as possible at one clinic visit, near to the patient, might improve rates of diagnosis and screening. Egypt faces challenges in retaining people in care because many of those with hepatitis C live in rural areas without easy access to hospitals. To test whether bringing screening, diagnosis and treatment to the village level was feasible, Gamal Shiha and colleagues from Mansoura University developed a community outreach programme designed to educate people about hepatitis C and start treatment rapidly. In the first phase the Educate, Test and Treat programme was implemented in 73 villages and achieved cure in 84% of people diagnosed with hepatitis C. Treatment was started a median of 2 weeks after diagnosis. To test whether they could speed up treatment initiation, the Mansoura University group used the Gene Xpert test platform to carry out point-of-care tests for hepatitis C RNA. A Gene Xpert machine can carry out a viral load test in two hours anywhere that electricity is available, making it highly suitable for point-of-care testing. Gene Xpert machines are already being used widely to carry out point-of-care testing for tuberculosis and HIV in sub-Saharan Africa. The researchers also took Fibroscan imaging and ultrasound equipment to villages to carry out fibrosis testing in people diagnosed with hepatitis C and did point-of-care testing of liver enzymes. The screening exercise employed two physicians, two radiologists, two Fibroscan operators, one pharmacist, four lab specialists, seven nurses and two data entry personnel. Screening began at 9 am. By 10 am 100 antibody tests had been carried out, of which 16 were positive. Eleven of 16 were confirmed to be RNA positive by midday and treatment was offered to these patients by 12.30 pm. During the interval between antibody test result and RNA test result all eleven people underwent Fibroscan and ultrasound scanning and blood tests for liver and renal function. Four hundred and seventy-five people were screened in one day, 43 were RNA positive and 40 started treatment on the same day. Three people did not begin treatment: one pregnant woman and two with hepatic lesions. The pilot study was carried out by the Egyptian charitable foundation ELRIAH (Egyptian Liver Research Initiative and Hospital), and offers a clear model for lower-income countries – and countries with low rates of linkage to care like the United States – said Dr Gamal Shiha, head of the charity and leader of the pilot study.